Preheat an oven to 400°F. Grease 18 standard muffin cups with butter or butter-flavored nonstick cooking spray; fill the unused cups one-third full with water to prevent warping. In a bowl, stir together the flour, bran flakes, raisins, wheat germ, baking soda, baking powder and salt. In another bowl, using an electric mixer on medium speed or a wooden spoon, cream together the butter, brown sugar and honey until fluffy. Beat in the yogurt, then the buttermilk and vanilla, until well blended and smooth. Make a well in the center of the flour mixture and add the butter mixture and the eggs. Beat just until evenly moistened. The batter will be thick and slightly lumpy. Spoon the batter into the prepared muffin cups, filling them level with the rim. Transfer the pan(s) to the oven and immediately reduce the oven temperature to 350°F. Bake the muffins until golden, dry and springy to the touch, and a toothpick inserted into the center of a muffin comes out clean, 18 to 22 minutes. Transfer the pan(s) to wire racks and let the muffins cool for at least 15 minutes. 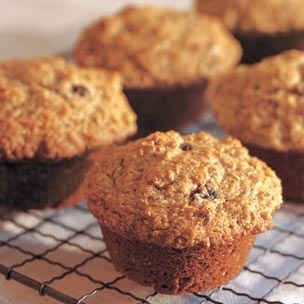 Remove the muffins from the pan(s) and serve warm or at room temperature.